One of the first things most travellers think about when planning a Japan trip is managing the costs. Japan is a pricey destination in the minds of many and it is true to a certain extent. Transport and food, the two most important things while travelling, do not always agree with your wallet in this North-East Asian paradise of cultures. A cheap breakfast meal at a 7-Eleven may cost you five or six US dollars, whereas you can get the same for two or three US dollars in most Asian countries. As for transport, Japan has a world-famous metro rail system, but moving around in the city without careful planning might cost you extra bucks. To help you with your planning, here is a list of things you can enjoy in one of the most visited cities in the world without going broke before your departure flight. 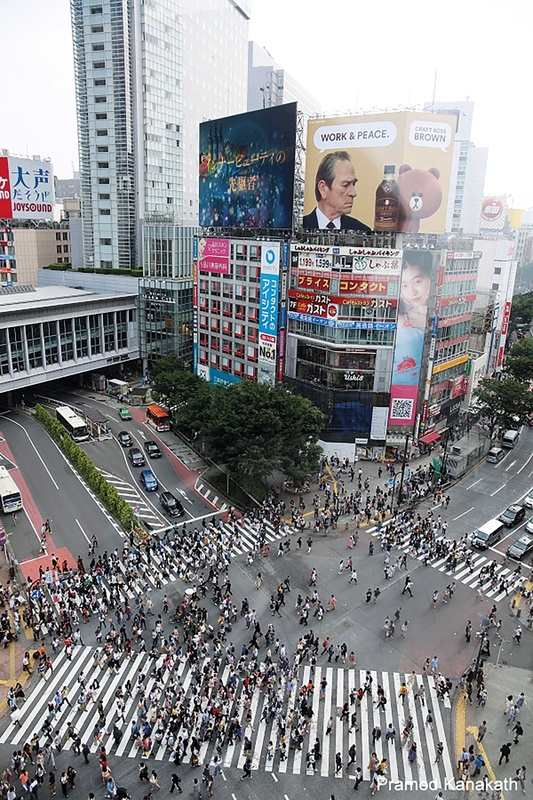 The famous “Scramble”, the Shibuya Crossing with five zebra crossings within a radius of a few metres, is where the world moves at once in different directions. There are at least four corners from where you can take a look at the crossings before you decide which direction to take. If you are coming out of the Shibuya station, you will see a Starbucks store in front of you. You will see customers lined up inside taking pictures of you and the other crossers. It is difficult to get a seat in this Starbucks, but there is an even better and cheaper place to get a great view of the crossings. Climb to the top floor of the Magnet by Shibuya 109 building (to the right of Starbucks) and enter the food court. On this floor you will see several cafes and an arrow pointing to the “Crossing Viewpoint”. Pay 500 yen and you can look down on the world as much as you like. Here you can get your photo taken by a fixed camera on the wall which focuses on you and the crossings below. And here’s the good thing – you can exchange the ticket for a snack or a drink at one of the cafes at Magnet 9. This is a courtyard of skyscrapers where high-end shopping is the norm. However, there are some popular shops where tourists can find bargains. The popular Japanese brand Uniqlo has the biggest of their stores in the world here. It is a 12-storey building where there is plenty to choose from for men, women and kids. The prices are cheaper compared to Uniqlo stores in your country. 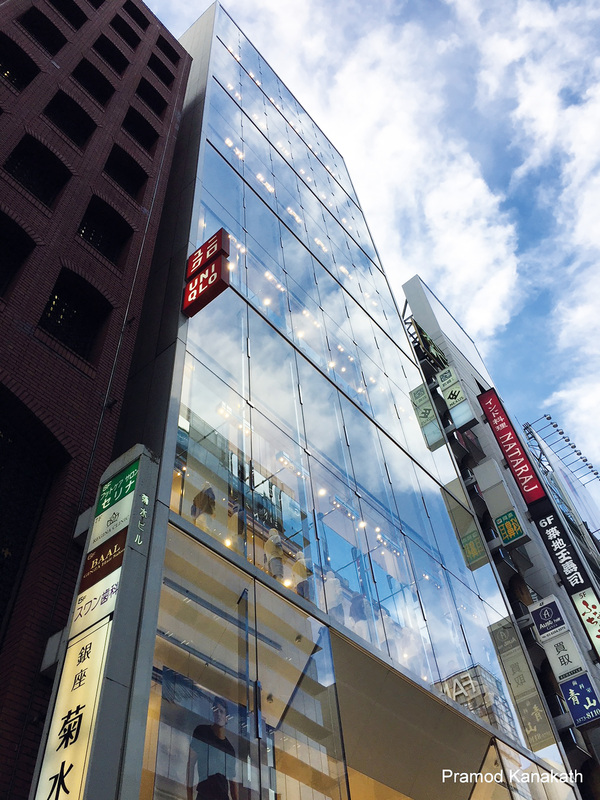 The same street has other fashion outlets like GU which will keep you at Ginza for at least half a day, if not till sunset. The restaurants and cafes can be very expensive in this part of Tokyo, but you might want to rest your legs and get refreshed. Walk two minutes to the left from Uniqlo towards the Nissan Crossing and turn left, and there and you will find Le Cafe Doutor, an excellent place to grab some reasonably priced coffee, juice and bites. Now comes food, an integral part of travel. Tsukiji Fish Market opens early morning for business and this is where locals go. The outer market is ready for breakfast as early as 5.30am and the narrow, winding streets here have an infinite variety of snacks and food to offer. Most items are cheap, but if you would like to dine in a more comfortable place there are small restaurants which serve sushi, ramen and soba noodle among others. The price range here is between 100 yen and 5,000 – 6,000 yen, depending on the place. The inner market has a tuna auction hall which is open to the public very early in the morning. The tuna auction is very famous here and you need to queue from very early in the morning to be one of the first 120 people of the day who will be admitted to watch. Many enthusiasts start queueing as early as 3am. The authorities are planning to shift the auction and the inner market to Toyosu in October 2018 and it will be called Toyosu Fish Market. 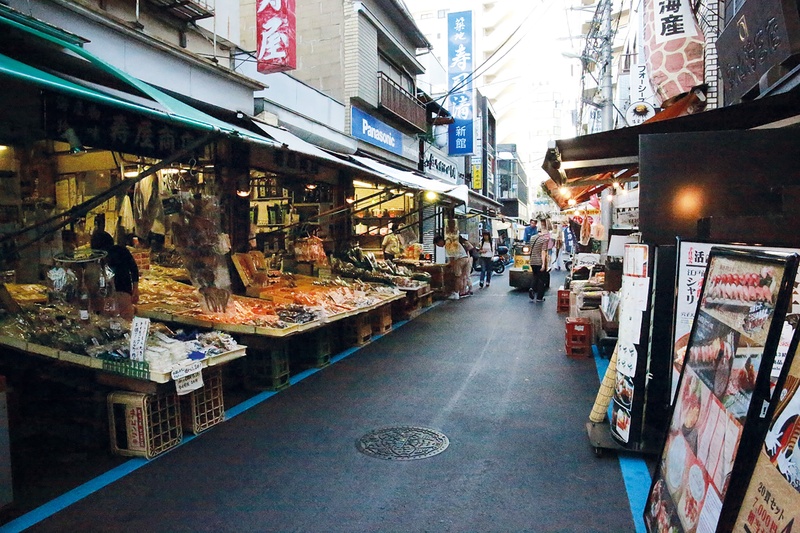 The outer market will still be in operation at Tsukiji. Skyscrapers are definitely among the attractions of big cities. We all love to pose for pictures with these giant modern architectural wonders in the background. And if a skyscraper happens to be exceptionally tall and shapely there is always a special interest. Not just to photograph it, but also to climb to the top and get those rare aerial views. 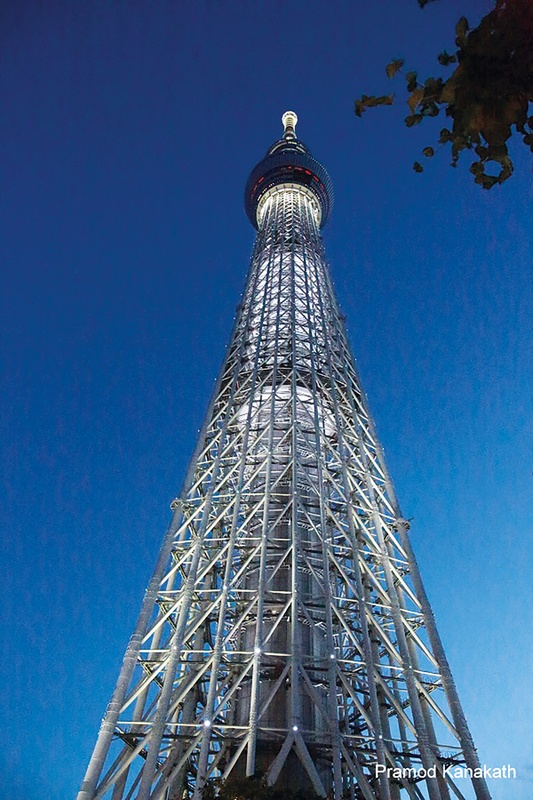 The Skytree Tower and its surroundings are very interesting to see, especially after dark. A bright tower standing above you under the night sky is an imposing sight. There is an open-air restaurant on the fourth floor next to the ticket counter. Get your tickets for 2,060 yen per person and get into the lift which will take you to the Tembo Deck 350 metres above. There is a restaurant, a cafe and some souvenir shops on this floor. If you still want to go higher up, pay another 1,030 yen and get to the Tembo Galleria at 450 metres. However, the view may not be much different from the Tembo Deck and, because the windows are smaller, taking photos may not be convenient. If you need a cheaper way to see Tokyo from above, go to the observation deck of the Tokyo Metropolitan Government Building in Shinjuku. Asakusa is the old town Tokyo and remnants of the Edo period can be seen here. 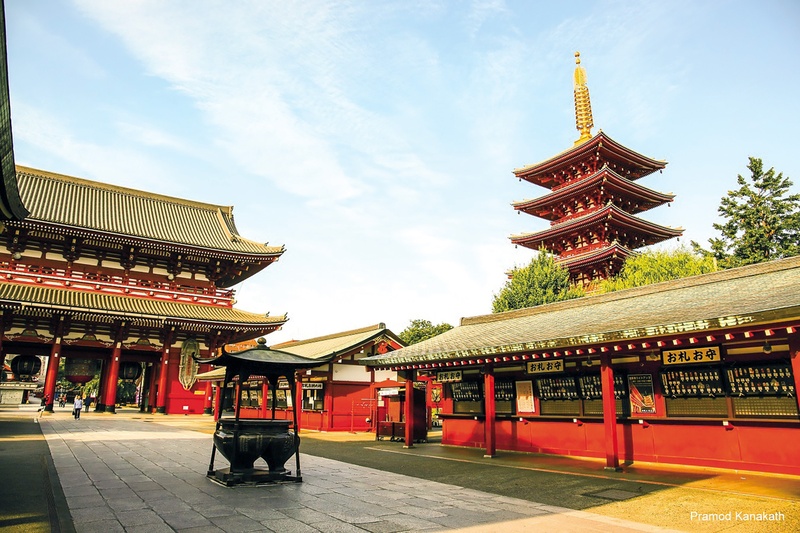 Senso-Ji Temple, or the Asakusa Kannon Temple (named after the Goddess, Kannon) is the oldest Buddhist temple in Japan. This is one of the most crowded attractions so get there by about 9.30 in the morning. Spend some time in the temple compound, photographing the architecture of the temple, the temple gate and the adjacent pagoda. Nakamise Street lies straight ahead of the temple, stretching for 200 metres with more shops on both sides. This is probably the best place to buy souvenirs in Tokyo. Also, the best place to buy a kimono if you want to add a traditional element to your Japan trip. Shops here sell them for around 5,000 yen. There are many streets off Nakamise Street where more shops and eateries can be found. Try a hot and tasty ramen or some affordable sashimi.